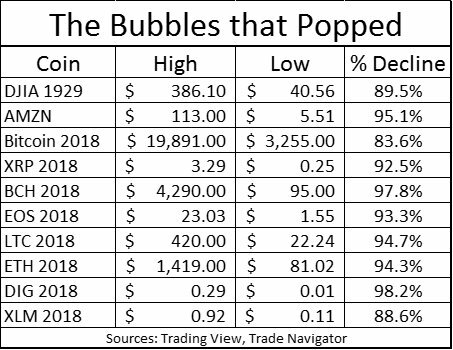 As the crypto winter digs in,leaving retail speculators gravely insensated,the big boys are joining the party....interesting times. We know how to navigate through tumultuous bear market in virtual currencies. By the time KQ cruises over Atlantic ocean pumpkin za @ obiero -master of perishable commodities across continents-zitakuwa zimeoza. #BTC is here to stay. The drop in Bitcoin is likely over now at $3495. Wave [Y] is Fibonacci 0.618 of wave [W]. I now expect Bitcoin to climb above $4580.00s soon in its path to regain the $6500.00s handle. 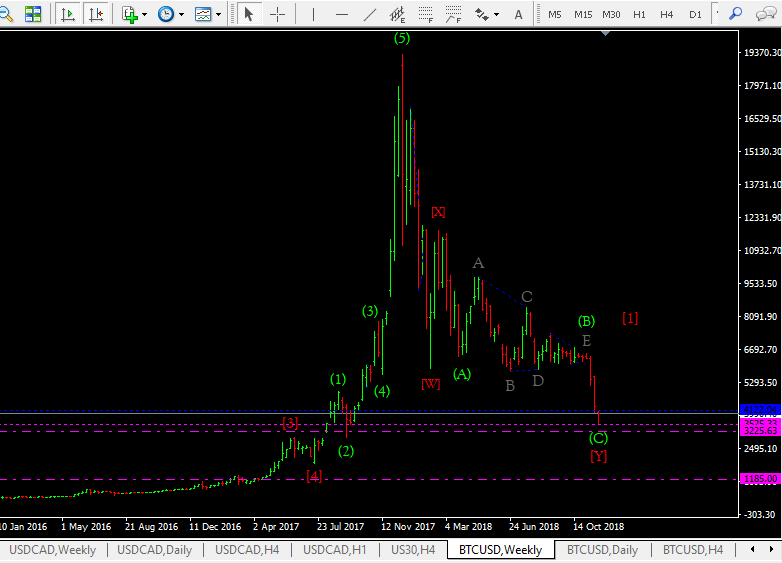 Bitcoin is completing wave (2) of the impulse wave . 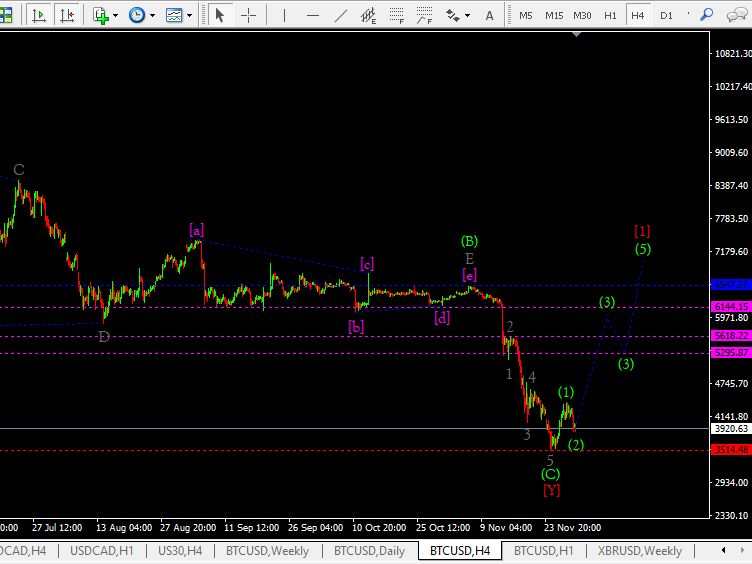 It should then rise in wave (3) with targets of $5295.00s or $6144.00s. The red line at $3514.00s is our line in the sand that should not be breached to the downside. I'm no TA expert but I doubt this thing has bottomed. These parabolic rallies have very nasty hangovers/sell offs. The current bounce is just a breather before the lower lows journey continues. The optimism of another bull charge has to be fully shaken off...that implies a testing of 2015 prices aka sub 1000. Still tanking...currently at around $3400 which is below your $3514 target to the downside. I hold that it will probably test sub 1000 to create enough energy for a substantial bull run. From $3000 I start loading up, though I do hope it can get to $1000 for me to get a sizeable chunk then forget it for the next 5 years. 3k or 3.4k,in 5yrs that wont really matter...you'll scroll back your BTC logarithmic chart and the 2017 ATH will appear as a tiny mound....leave the chasing of huge green candles to the noobs. I have been studying the cryptocurrency market for a few months. During this time, I have witnessed over half a trillion dollars worth of capital erosion. It has been a bad bloodbath for speculators during the period. However, I have reason to believe that there are still scarce opportunities to make money in that market. I am a fundamentalist, but fundamental analysis is technically impossible in the cryptocurrency market because most of them are just projects on paper. Bearing in mind that I am not well versed with technical analysis either, I have decided to risk a paltry Ksh 300,000 ($3000) to speculate in the turbulent market. Goal: To make a modest return in a bear market. Buying:-I will actively search for coins and tokens that demonstrate an upward trend in both price and volume over thirty days. Selling:- I will sell any coin that does the reverse but instead of waiting for thirty days, I will use fifteen days to stem any losses incurred. Number of coins/tokens:- For diversification purposes, I will only speculate in 3 or 4 coins/tokens at any given time. The capital will be shared proportionally between the coins/tokens. Portfolio rebalancing will be carried out every time I cash out of a coin. Volume trend: Volume has been increasing steadily in the last 30 days. Often trades more than 5% of its total market capitalization every 24 hrs. There is an upcoming coin burn in April which might prop the price upwards. Volume trend: The coin has been experiencing volumes of above 10% of its total market capitalization in 24 hrs and the volume is on an upward trajectory too. Volume trend: Volume has been increasing steadily too. Over 30% of total market capitalization has been traded in 24 hr periods in the last few days. NB: My investment horizon is undefined. This is not investment advice and is for experimental purposes only. I risked $3000 because I am also prepared to lose it all in the murky waters of cryptocurrency speculation.Fortune favors the bold. Also, as a disclaimer, I have zero knowledge in trading/speculating in digital assets. I welcome any advice. I could use it in future so go for it. I am all ears. Sawa Chief. Please take whatever I have to say with a (BIG) pinch of salt. I only share, in the hope of learning from (your) feedback. In my little experience, I've come to realize there are no gurus in crypto. The same is epitomized in real-life, where a child will get right some IQ questions, that adults fail... most like due to preconceptions and/or assumptions. Let me first start with your narrative.. Fundamentals are important. Very. But not the most important. In my opinion, crypto is being driven by mass euphoria, on the surface. It's still a bubble with the people majority behaving like a herd. There are those that have thought well ahead of time, mostly 'whales' not only currently win, but will be future winners! Here you might want to evaluate your goals.. Short or Longterm? Personally, I want my money in my pocket. Trend following. Probably your best possible strategy, if you are trading. BUT you might have to work to be among the first in, anything else might lead to either paltry returns or losses! Modest returns, wise Equate what only 5% a week will give you in a year. 30 / 15 days? That is a loooooonnnngggg time in crypto. Things change in minutes! You need to keep abreast with news. It has been argued that crypto becomes a way of life for anybody in it. One can't afford to make a trade and check 15 days later! Stop loss is the safety belt, you can NEVER do without! I'll start by (my) cardinal rule. Bitcoin is king! It goes up, Alts go down! It goes down, Alts go down!!! An Alt will only rise when Bitcoin is stable, or there is some fundamental news that will defy the general public's perception of it inspite of what is happening with Bitcoin. Else you'll be lest holding a bag like those who bought BTC @20k.. Sometimes, the gain in a coin is the sure indicator to keep very very far from it. Remember what I said, to either try be the first in; or evaluate what is driving a trend and how long it is likely to last, before risking your money. I think it is a very exciting but a scary venture. I haven't invested in cryptocurrency but my friend has and he lost all of his money. I understand that it also depends on your knowledge and the amount of common sense you use. I guess being careful and having good information about what the market is liike and how volatile is bitcoin. This can be useful in being stable in the marfket and getting some good profit. But for me, the stock market seems easier than cryptocurrency where the stock broker actually handles everything. Stock market isn't this volatile and is less risky than crypto. There are markets like commodity and currency trading which can be very risky giving extreme losses. Your plan seems pretty legit. The way cryptocurrency market is investors can earn huge profits and as they are limited as well, the scarcity will give an edge to the profit. The bitcoin stocks hit a new low this year 2018 which was pretty shocking. I hope you can earn good profit in this. As with all money markets, unless you have CONNECTIONS here, you are flying blind. What are the right connections to have? Someone who works high up in a major exchange. They are the primary movers of crypto prices. This holds true for most shitcoins,remember the fast fading "binance/coinbase effect"...for BTC things are even murkier especially with the advent of the paper (fiat) settled CME/CBOE bitcoin futures.Atleast BAKKT futures promises physical BTC settlement. Holy smokes! !...100b total market cap barely holding...awesome times ladies and gentlemen,awesome times! We need to realize that Cryptocurrency is the future of the world. I know that there are some issues in them but they can be solved with discussion. We just need to see what Venezuela is doing with Cryptocurrency and how it has affected their almost broken economy. Cryptocurrency will make you money in a month what would take a decade on the stock market, at the same time it may render you bankrupt if you place all your wealth there and forget to cash out during the bull run. The trick is to harvest as the price goes higher to remain sober so that when the market is red, you will be praying for even lower prices for you to accumulate more. I say this out of experience, ulizeni maswali mjibiwe. What bags are you holding? Useful site with loads of various crypto metrics.Certainly more granular than "Coinmarket cap" site. A successful man is not he who gets the best, it is he who makes the best from what he gets. Good call,missed out on this one,chose to double down on BNB instead (no complains).However,jamaa will front-run you if you hodl till 14th.